The right way to witness a Will. There are strict rules in English law about how to witness a Will. If you don’t get it right your Will could be invalid. The rules about how to witness a Will are not complicated. Unfortunately, people do sometimes make mistakes when witnessing a Will and that can cause problems. You might be thinking “isn’t it the job of the professional who prepared my Will to make sure it’s properly signed and witnessed?”. Well, you’d be right if a professional is involved at the signing stage. Not everyone uses a professional to prepare their Will these days and even if they do the professional might not be present when the Will is signed. If a solicitor or Will writer isn’t going to be present when you sign your Will they may disclaim responsibility. That means your relatives could be left without compensation if your Will is later declared invalid. The rules about how to witness a Will are set out in section 9 of the Wills Act 1837. If these rules are not followed it could result in delays and expense when the person dies. It could even lead to the Will being challenged in the courts. At least 3 people must be involved in signing a Will made in England and Wales. They are the testator – the person whose Will it is and two persons who act as witnesses. In some circumstances, there may be more than 3 people involved. If the testator is physically unable to sign the document, for example, there could be 4 people. Those people would be the testator, the person signing on behalf of the testator and two witnesses. The witnesses must be present AT THE SAME TIME. For some reason, there are people who find it incredibly difficult to stay put while a document is being signed. As soon as they’ve added their signature they get up and wander off. I’ve lost count of the times I’ve had to stop witnesses who’re about to leave before everyone has signed. 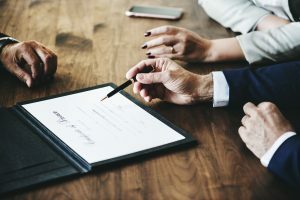 The witnesses to a Will must either see the testator sign or be present when the testator acknowledges their signature. Likewise, a witness can acknowledge their signature to the testator if the testator was absent. What does ‘acknowledging’ a signature mean? Basically, if the testator or a witness signs when not everyone is present, that person can confirm later that he or she signed the Will. The acknowledgement must be made in front of the same set of people. Example: Ted signs his Will in the presence of two witnesses, Nila and Barbara. While Barbara is signing Ted goes out of the room for a moment. When he returns Barbara points to her own signature and says to Ted “That’s my signature. I’ve witnessed your Will”. Nila was present when Barbara signed and Barbara confirms to Ted that the signature she’s just added is hers. Barbara has acknowledged her signature to Ted in the presence of Nila. Don’t forget to sign the Will yourself – that does happen! Check your witnesses are over 18 and have mental capacity. Are homemade Wills likely to be challenged? Rosamund Evans is a solicitor and a full member of the Society of Trust and Estate Practitioners and an accredited member of Solicitors For The Elderly. She writes and presents on issues relating to age and disability.